This Saskatchewan area inn is just 5 minutes' drive from the Saskatchewan Sports Hall of Fame Museum. Free continental breakfast is provided and rooms feature cable TV. 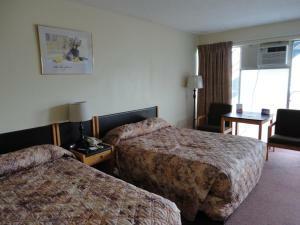 Rooms feature a small fridge, and a microwave at Knights Inn Regina. A seating area is also available. The Regina Knights Inn offers on site dining at the Knights Inn Restaurant. East Indian cuisine is featured and the restaurant is open for dinner. Close to downtown, this hotel is just 2 km from the Globe Theatre. Royal Saskatchewan is 5 minutes? drive away.